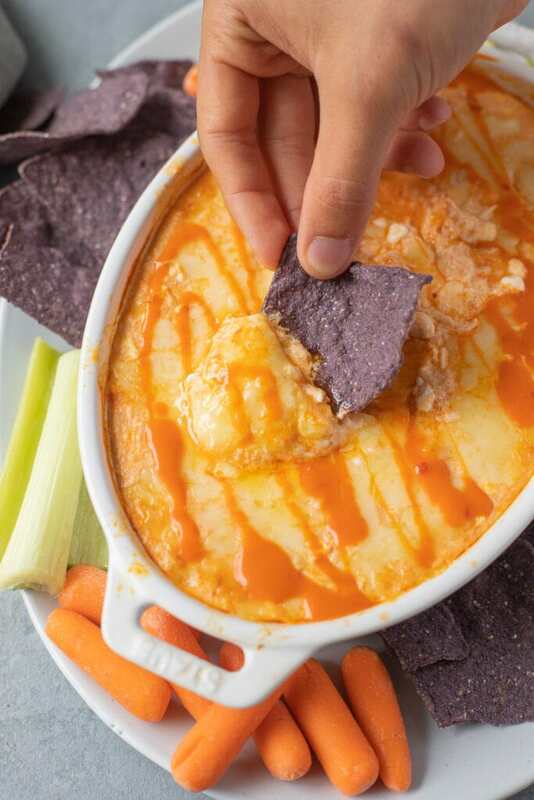 Healthy Buffalo Chicken Dip is a delicious, lighter version of your favorite appetizer! 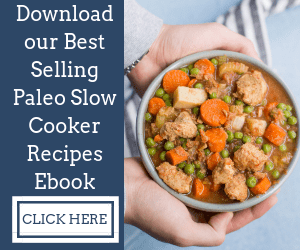 Easy, gluten free, keto & loaded with flavor – you’ll love it! I mean is there anything better than cheesy, spicy healthy buffalo chicken dip? Let me answer that for you… uh no, no there is not. Seriously who thought of this? Like let’s take two of the best things ever, cheese, and franks red hot, mix them with chicken, and bake them until it’s all melty and delicious? IDK who thought of them, but I love them for it. 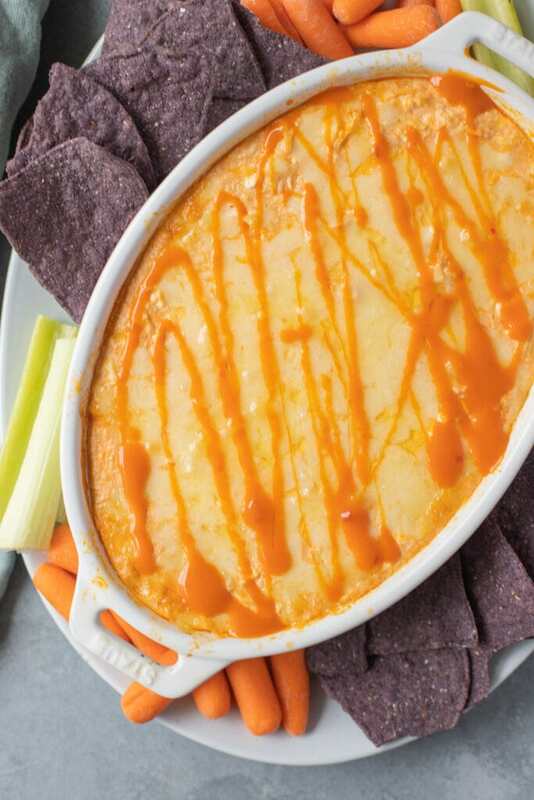 What makes this buffalo chicken dip healthy? Buffalo chicken dip is usually made with tons of cheese, ranch or blue cheese dressing and cream cheese which makes it super high in fat. I swapped out cream cheese/dressing for greek yogurt and cottage cheese. The greek yogurt/cottage cheese mix still makes this rich and creamy, with way less fat and a whole lot more protein! I also added a little bit less cheese to it, but if you want to go ahead and add more in – I’m not going to tell you no. Live your best life, ADD THAT CHEESE. 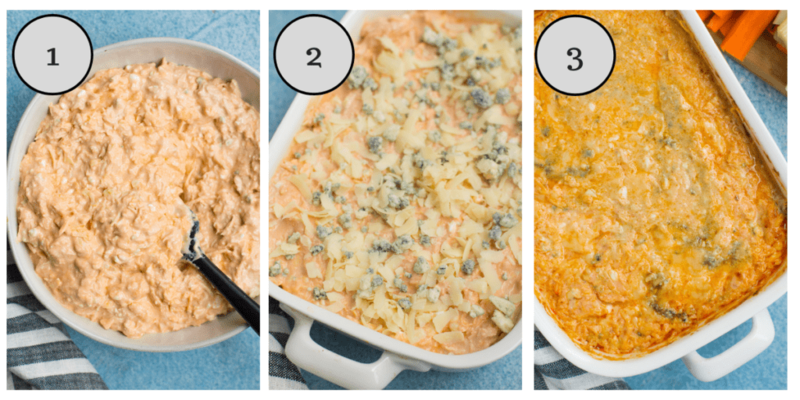 Now, let’s get into what you’re here for – how do you make healthy buffalo chicken dip?! 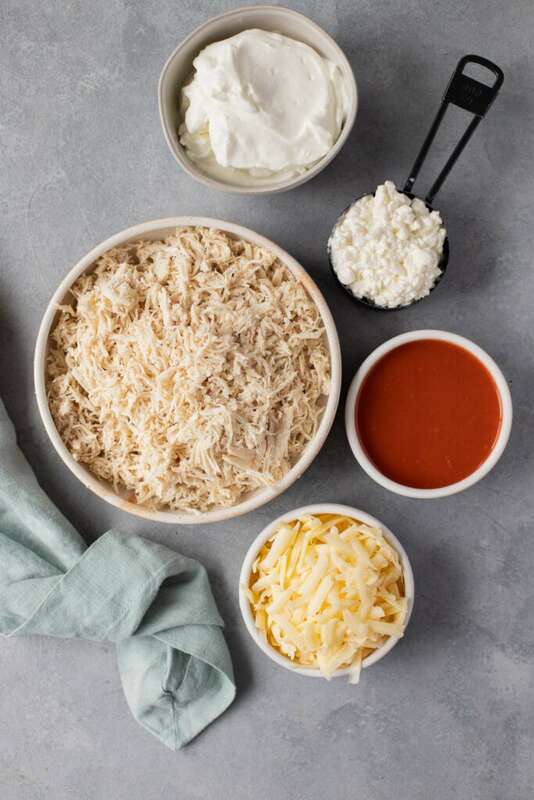 Making healthy buffalo chicken dip is ridiculously easy. 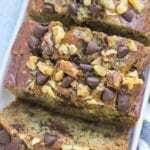 You only need 6 ingredients. Once you have your ingredients all laid out mix them together until thoroughly combined. Then – pour into an 8×8 glass baking dish (or a glass pie plate!) and bake! You can totally top with extra cheese before popping it in the oven, but you don’t have to! Chips – these chips are yummy! 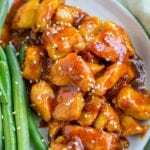 Veggies – Celery, peppers and carrots go well with this. 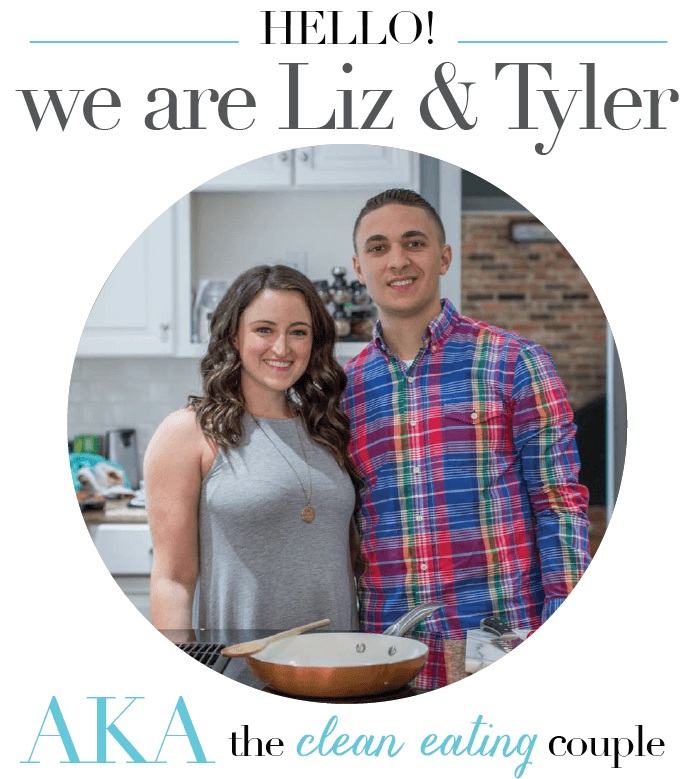 A spoon… kidding? Not really. It’s that good. 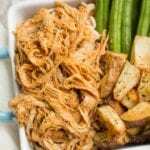 Can you make this healthy buffalo chicken dip in the crockpot? 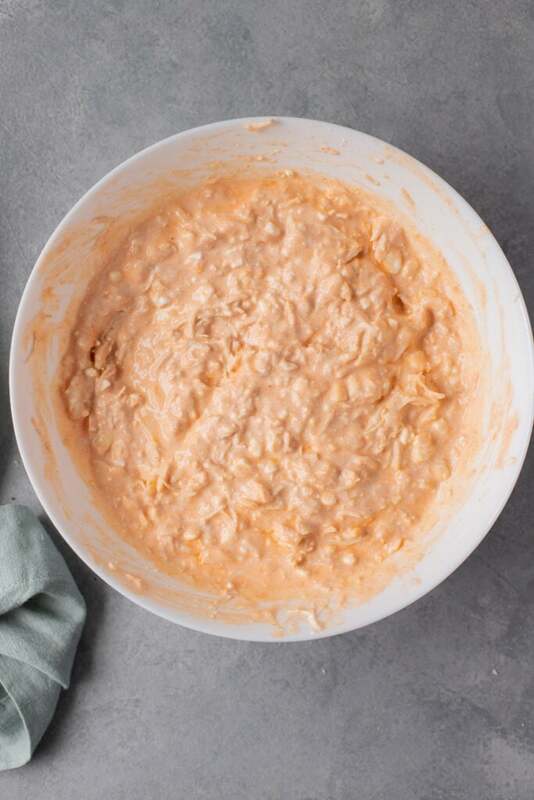 You really don’t need to dirty your crockpot to make this healthy buffalo chicken dip, but if you’d like to you can cook it on low for 2-3 hours in your slow cooker! 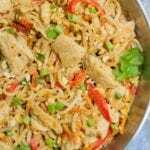 You have a few options for how to make shredded chicken. 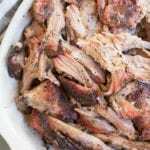 Boiled chicken: You can boil chicken for about 15 minutes until it is entirely cooked and then shred. You could use canned chicken… but TBH I think it’s gross and bouncy. You do you though! 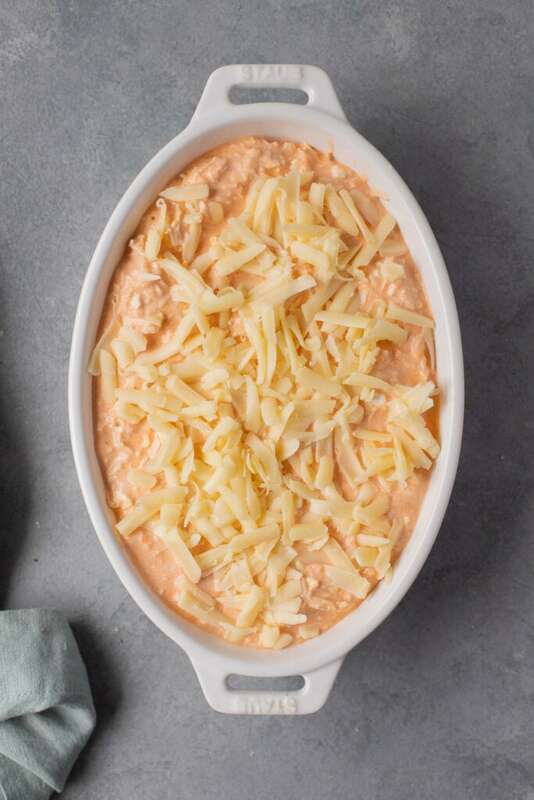 Healthy Buffalo Chicken Dip is a delicious, lighter version of your favorite appetizer! 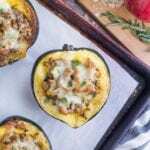 Easy, gluten free, keto & loaded with flavor - you'll love it! In a bowl mix all ingredients until thoroughly combined. Pour dip batter into a glass 8x8 pan (top with extra cheese if desired!) + bake at 350 for 25 mins. 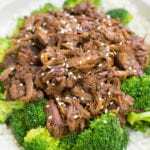 Serve with chips or veggies or choice. Chips - these chips are yummy! Veggies - Celery, peppers and carrots go well with this. I was literally waiting for you to email this out. Just made it and OMG IT IS SO GOOD!!!! Will be making this every week for watching football! so yummy! What would you suggest to replace the blue cheese with if your not a “blue cheese fan”? Colby Jack? Hi Andrea – You could use pepper jack, colby jack.. really any cheese will work! Made this last Sunday for the game and my dad/uncle LOVED it!! It was completely gone in 20 minutes. I served it with tortilla chips and carrots and both were delicious! Definitely making again for Super Bowl Sunday! Yay!! It definitely is just as good as the not-so-healthy version 🙂 I’m glad you enjoyed it!! I made this last weekend and it was the perfect potluck contribution! Love that it’s healthy too, no one even knew! I’m so glad everyone liked it, Amanda!! That is awesome! Soo good! Can’t tell it is a healthier version at all! Better in my opinion. I’m so glad you liked it, Sarah!! LOVE hearing that, Megan – especially that your kiddo liked it 🙂 Thank you so much for sharing it with friends – we really appreciate that! !